Earlier year I was at the wonderful SUMMIT photography conference and workshops in Liverpool, and received a congratulatory text from a college that I had been shortlisted for Wedding Photographer of the Year in the highly competitive East Midlands region of the 2017 Wedding Industry Awards. TWIA happens every year and is the benchmark for quality in our profession, it’s really the award that every photographer wants to have on their shelf! To me it’s so valuable because the winners are decided not just by a judging panel of industry experts, but by the previous years clients who vote and leave detailed reviews. Once shortlisted the judges decide the winner based on the client comments and a portfolio of images. The awards was a posh do held in Nottinghamshire, and I knew some very deserving winners in other categories (looking at you Pink Cake Box!) but I was home on the sofa periodically checking my twitter feed. I honestly never expected to place, there were about 20 shortlisted and they are all phenomenally talented. 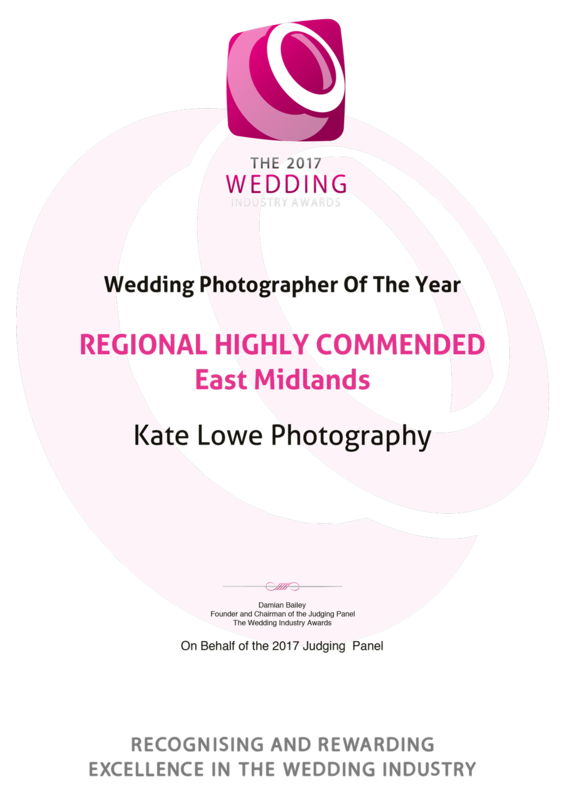 When a congratulatory notification popped up the news that I had been Highly Commended for the Best Wedding Photographer in the East Midlands, I was so surprised and joyful and had a cheeky gin and tonic to celebrate! Once the awards are over, the voter’s comments are released and I get to have a peek at what my clients said. I’ve included some below and it’s wonderful to read them, it makes me so happy at the end of a year of really hard work to know I’ve made people happy by doing what I love most. My couples are all incredible to let me in to capture their most important day and then be so generous with their time and kind words. So thank-you, all of you lovely people who took time from your day to vote and leave your comments, you guys rock! “As soon as we spoke to kate we knew her knowledge and expertise were exactly what we were looking for to capture all of our special moments during the day. She made us feel so relaxed and comfortable it felt like one less thing to worry about as we had the confidence to let Kate do her thing! The photographs came back stunning and we were so pleased! Thanks Kate!